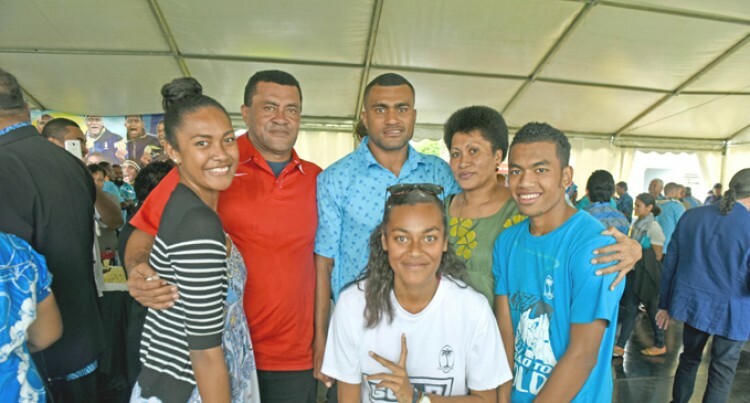 From left: Kasanita Ratulailai, Osea Bola, Apisai Domolailai, Lorima Biu (Mum), John Qoroya(brother) and Seinigigia Vosailagi. Photo: PAULINI RATULAILAI. Team Fiji men’s rugby sevens forward Apisai Domolailai’s wife Kini was a proud woman after witnessing her husband’s achievement at the ANZ Stadium, Suva on Monday. She said they were unfortunate not to have spent their first wedding anniversary together because of Apisai’s commitment to the Rio campaign. “But it was all worth it,” she said. Kini was part of the celebrations in Nadi on Sunday and was glad to be able to make it to Suva and saw her husband being awarded the second highest award– Officer of the Order of Fiji. “I’m so happy for him even though there were other players out there. He was able to make it to the team. He left 15s when chosen for the 7s team, there were a lot of sacrifices made but it was all worth it,” she said. She acknowledged the Fiji Hideaway Resort which was where her husband’s rugby career started. “Apisai was not in any club he and Jasa Veremalua were the representatives of the Hideaway Hurricanes. “I thank the Lord for bringing him this far, I’m grateful to his family. I’m thankful to my parents for keeping him in their prayers and fasting for him,” she added.